Major record labels cling to blockbuster albums like a toddler clings to a security blanket. They just don’t want to let go. In an uncertain world full of fickle fans and bleak economic conditions there is always someone who wants to buy Rumours or The Dark Side Of The Moon. The big corporations would prefer to give the public what they know they like, not what they might like. This explains why in 1999 EMI reissued Paul McCartney‘s Band on the Run as a boxed two-disc deluxe edition and then tackled nothing further from his catalogue for the next eight years. EMI apparently lacked the enthusiasm or inclination to work up deluxe versions of Wings albums like London Town or Back To The Egg, when the rewards were uncertain rather than guaranteed. This lack of inspiration may have contributed to McCartney bidding the institution adieu in 2007, and it was at that point, inspired by de facto manager Scott Rodger, the ex-Beatle started sorting out his archive and began planning for an extensive reissue campaign. The first fruits of this labour emerged in 2010, when the album least deserving of a reissue – Band On The Run – was reissued again. INXS have ‘suffered’ similarly, as far as back catalogue goes. 1987’s six million selling Kick dominates record label thinking. It is the world’s favourite INXS album, and the situation almost mirrors that of Band On The Run. 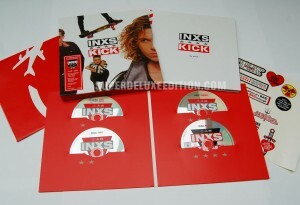 A 2CD deluxe edition was released in 2002, and with no significant activity around the nine other Hutchence-era INXS albums since that time, Universal have chosen to reissue Kick again in 2012 (to celebrate the 25th anniversary) as another two-disc deluxe edition, but this time also as a four-disc super deluxe edition box set. This is interesting, because although the set is being marketed as a super deluxe edition, it is smaller and cheaper than ‘standard’ SDE sets (around £45 in the UK). It’s actually a lovely size. Just short of ten inches square, it’s easy to hold in your hands, but weighty enough to feel substantial. The sturdy outer slipcase has good artwork reproduction and feels very well made. Inside resides an 84-page hard back book (“the words”); a red disc wallet for the CDs and DVD (“the music”); a large reproduction of a Mystify poster; and a sticker sheet. Extensive photos can be found here. The book is good. A cut-down version of the big books you get in super deluxe editions like The Who‘s Quadrophenia or The Rolling Stones‘ Some Girls. It’s great to have something to read, not just photos from the era. The volume takes as through the making of the album, the sleeve design, videos and the success and aftermath of Kick. To be honest it looks (and feels) like it has been digitally printed, rather than using the traditional four-colour repro print process. The slightly shiny pages and photo reproductions offer tell-tale signs. A minor point maybe, but don’t expect anything like the quality of the books in McCartney’s deluxe sets which are in a different league to what is presented here. Nevertheless, as a physical set the Kick 25 super deluxe edition is a very pleasing package and one that I’d like to see utilised for more releases in the future. Disc one is the standard album with no bonus tracks appended; disc two is a selection of bonus tracks including demos, live songs, remixes and b-sides; and disc three contains further remixes. There are seven tracks on this three-CD selection that were not on the previous two-CD set. They are made up of seven-inch edits (New Sensation, Devil Inside, Different World) a B-side (Do Wot You Do – also on the Pretty In Pink soundtrack), an extended remix (Devil Inside) and finally, two previously unreleased remixes, a “Soul Version” of New Sensation (appears to be a period remix) and a June 2012 “Kids On Bridges Remix” of Calling All Nations. You can hear the later in full here. Those tracks were all officially released on singles at the time. It’s not as if there is a lack of space. Disc three only contains 33 minutes of music! In fact the three discs in this set offer 240 minutes of capacity, of which only 130 minutes are used up. Just over half. Also, the tracks included over the two bonus CDs have no structure around the running order. Extended remixes could have been grouped together, as could seven-inch edits and B-sides. If nothing else that would have prevented two versions of New Sensation and two versions of Devil Inside sequenced together, as happens on the third disc. Another issue is that the listener, who may not be an INXS expert, is not given much help around where the tracks came from in the first place. Not everyone will know that Move On was the B-side to Need You Tonight or that Different World was from the Crocodile Dundee soundtrack. Why not inform and educate the listener as to what they are listening to? Below: The video to New Sensation – a click away on YouTube but not on the DVD in this super deluxe edition box set. The DVD offers a brand new documentary called Track Baby Track, about the making of the album. Song by song, all the band members offer their own personal memories of making the record. Obviously, with Michael Hutchence, archive interview footage is used. It’s a very interesting piece, with Andrew Farriss in particular delivering some good insight in terms of the band and what they were trying to achieve with Kick. There are plenty of video clips to keep things interesting. A fifteen minute section of home movie footage – Through Our Eyes Only – from the Calling All Nations world tour gives us a band member’s eye of life on the road. Cue lots of larking around. Although the first two features on the DVD are very good, the final section of the disc is entitled ‘promos’ and contains just three videos from the album (Mystify, Guns In The Sky and Need You Tonight). Arguably, only Need You Tonight has a higher profile than Never Tear Us Apart or New Sensation, but inexplicably the videos for the later two songs are missing from this section. 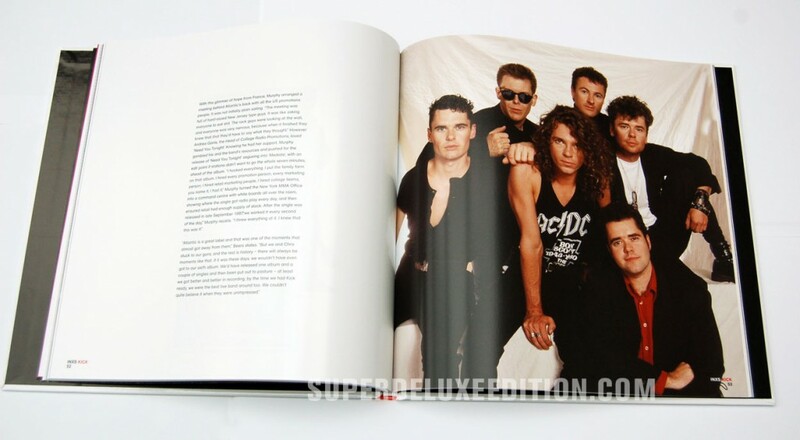 We know they exist because there are clips of them in the documentary and director Richard Lowenstein talks about them in the book that forms part of this super deluxe edition. About New Sensation: “I knew we’d made something special in Prague”. Yes, so special that Universal don’t want it to be part of Kick 25. Also missing are videos for Mediate (a homage to Bob Dylan’s Subterranean Homesick Blues) and Devil Inside. So that’s four videos gone AWOL. Unacceptable. Someone please direct me to the nearest brick wall so I can bang my head against it. The DVD only runs for just over an hour in total, so there is bags of space for more content. Period interviews and TV appearances could also have been included. Kick remains a superb album. A defining record of the era. But I’m sorry to say that another super deluxe edition box set comes and goes and you are left thinking about what could have been, what should have been. The INXS Kick 25 box is a great physical package, but it needs to be more than that. Essential content like promo videos are lacking and as far as the audio content goes, the record label had the space across three discs to make this a completely comprehensive round up of all officially released Kick-era tracks. Why is it so hard to give fans what they want? Answers on a postcard please. It is in the best interest of the record labels after all, they will make more money. Do they do this deliberately (‘saving’ some content for the 30th anniversary) or is it incompetence? Who knows? All I can say is if this is their idea of a 25th anniversary ‘celebration’ don’t ask Universal Music to organise your birthday party. They’ll forget the cake and only invite half of your friends. Audio tracks in bold were not on the previous 2-disc set, everything else was. Bit late to the moaning party here, but the big shame about missing the ‘Never Tear Us Apart’ video is that the video version was effectively an extended mix with a longer intro than the single. “Different World” was actually first a b-side to the Australian version of the “Listen Like Thieves” single. That said…sigh. Huge INXS fan, disappointing news. But every reissue of theirs has been bizarre and vaguely nonsensical. Some of their b-sides have never, ever been collected on disc. In fairness, this does eliminate all the non-album b-sides for once. Even if it’s only for this one album. And they did do the “digital 45” thing, which is nice for the others that were never collected. For the love of all that’s f#cking Holy , how the hell can such a simple proposition go so badly wrong (again) !. I mean , c’mon, how many braincells do you need to have to realise that you really should include ALL the promo videos from an album, if you’re determined to have a DVD . And tell the punters where the tracks actually appeared at the time of release. Another balls up . When this super-deluxe edition was first announced, I was sure I would be scraping together the cash to buy one. Having read this excellent review, now I’m not so sure. Among the period items not included is the excellent band history documentary ‘In Search of Excellence’, made at the end of the ‘Kick’ tour. Maybe the band didn’t want to detract from the new doc, but ‘Excellence’ is something many fans would love to see on DVD; considering nobody seems too keen to issue it in its own right, this would have been a lovely place for its overdue re-emergence. The inclusion of both that and the couple of missing promos would have finally meant the end of two official VHS releases some of us have stored away gathering dust. With so many opportunities missed, I’ll only pick this up if it drops below £20, since I already have the 2002 reissue. Now, where’s that reissue of ‘The Swing’ with the ‘Swing & Other Stories’ VHS included on a bonus DVD? That would be nice. Even though this Kick is a bit of a missed opportunity, I really hope they DON’T do a 30th anniversary. Like you say The Swing would be great, as would Welcome To Wherever You Are. Kick is one of my all-time favorites, yet somehow I missed the last reissue. So, when I saw this one coming I was glad that I hadn’t bought the last one thinking this would be the definitive version. But your review makes it clear that it only goes 2/3 of the way to being definitive. Agree completely the record companies would make more money if they’d just give the fans what they want — think I’ll wait on this one until either I find it on some great discount or a truly comprehensive 30th anniversary edition comes out in its place. Dave – if you don’t have the 2CD then there is still much to enjoy. However fans that do have that set are likely to feel short changed. I agree that new remix is surprisingly good. Check out the facebook page (facebook.com/superdeluxeedition) where you can hear three different versions. I have no idea what happened with that Niles Rodgers remix. I saw it listed as well. There seems to be a lack of passion as far as I can see. No one in Universal’s offices looking to delight and surprise fans with really rare things or at least a comprehensive selection. This isn’t quite as horrible as the “So” deluxe edition, but it’s close. Why in the WORLD would they leave off so many 12″ versions and the promo videos?????? The promo video thing is ludicrous! !